I would’ve liked to know Lady Jane and her intense love for scripture. While I bow over my Bible daily, my faith has never been tested in the ways Jady Jane’s was. Lady Jane Grey was beheaded by royal decree for high treason against Mary I of England on February 12th, 1554. She had been the Protestant Queen of England for nine days. When the fifteen-year-old Protestant king Edward VI lay dying, he changed his will to delegitimize his Catholic half-sister Mary (she would later be immortalized as “Bloody Mary” by Protestants) and to remove her from the succession. Instead, he named his Protestant cousin Jane and her male heirs to the throne of England. After his death, sixteen-year-old Jane was proclaimed queen, but before she could be crowned, her support evaporated under aggressive attacks by Mary’s Catholic supporters. Jane’s Privy Council abandoned her and proclaimed their loyalty to Mary. Jane was deposed on July 19th, 1553 and held in the Tower of London, after a scant nine days of rule. Convicted of high treason, she was initially spared death by Mary, but her father's participation in an attempted rebellion made her too dangerous. She was beheaded by an apologetic headsman while clutching a book of Protestant prayers. She became revered as a martyr throughout England. 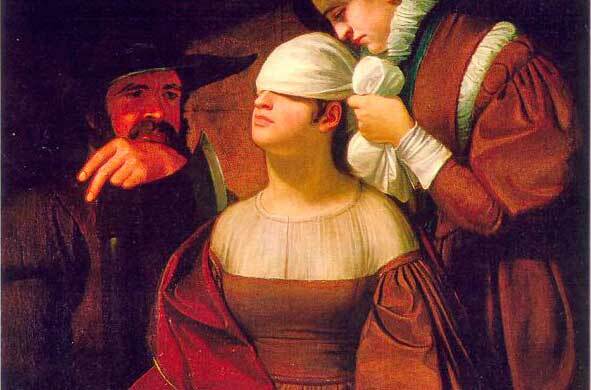 Preparing Lady Jane Grey for Execution, by George Whiting Flagg. Three days before Jane’s beheading, Queen Mary directed that her personal chaplain John Feckenham should attempt to convert Jane to Catholicism. Displeased by this at first, Jane quickly grew close to Feckenham and he was allowed to accompany her to her execution. Much of their final conversation was reproduced by John Foxe in his Book of Martyrs. It was treasured by English Protestants as they underwent persecution. Her final remark to Feckenham, to whom she had grown very close, was especially treasured as an example of humility and meekness, indeed, a statement summing up much of what the Reformation movement stood for. By “utterance” she had in mind the great Reformation truth of Sola Scriptura. Scripture alone. Encapsulated in her brief, pithy phrase to John Feckenham is the great truth that Truth is God’s to give, and God’s alone. As a twenty-first century believer, I am inundated with monumental works penned by monumental men and women of God. The utterances of the reformers and their successors can be overwhelming at times. Names like Calvin, Luther, Spurgeon, Edwards, Owen, Watts, Cowper, and Herbert echo down the hallway of time. But there is only one book in which Yahweh himself, holy, majestic, and enthroned in glory, has uttered his Word. That means there is only one book I need to master. And he suffers no man to master his Word except through his Spirit, by his mercy, opening the eyes of one’s heart. So when I open my copy of the Scriptures early in the morning, I am painfully awake to the fact that, of myself, I can see nothing of consequence. Unless the Lord of the Universe deigns to mercifully reveal himself, I can see no glory in the Scriptures. So I pour my cup of french press coffee, sit down with my Bible at my battered kitchen table, quiet my three kids, and silently pray for mercy, Spirit, and eyes that can see. And the wonderful thing about our God is that when we pray for those three in true humility, he never gives us a stone. “Ask, and you shall receive. Seek, and you shall find (Matthew 7:7).” He has promised never to turn away his children empty handed.